Every time the weather starts to turn chilly, I know it is time to start stitching a new pair of slippers! Lucky for us, episode five of season nine has two great options for slipper boots. First up, our dear friend Rohn Strong is back with us, ready to demonstrate my knitted Cable Cuffed Boots. These super-cozy slippers are great for keeping your feet warm anytime of the year. Now you can lounge around in comfort and style! In this same episode we also will be making crochet felted slippers with Jenny King. She's here again with us all the way from Australia. Aren't we happy that she is willing to make the 24-hour-plus flight to come be with us!? 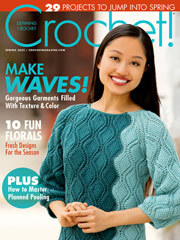 She shows us how to just pop your crochet slippers in a hot wash and shrink away for a snug fit. Prepare for cold days by slipping your feet into these warm and cozy slippers! Are you like me and can't get enough of everything slippers? Well, then let me take this oppurtunity to share some of my favorites that I have designed in the past. 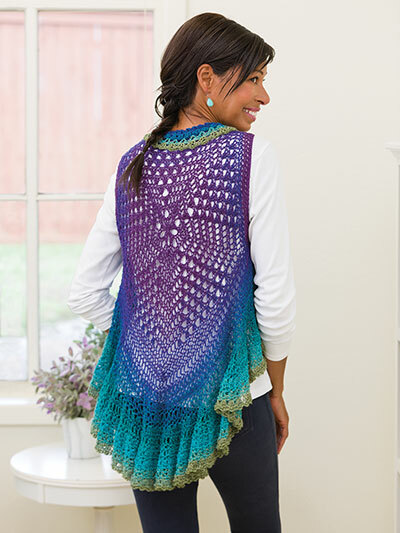 If you are looking for style and warmth, this is the crochet project for you. The classic style of these crocheted slippers makes them a perfect gift that will be loved by the recipient. These slippers are worked in 2 pieces. The foot is worked first, then the ribbed cuff is worked and sewn to the lower foot section. Easy peasy! 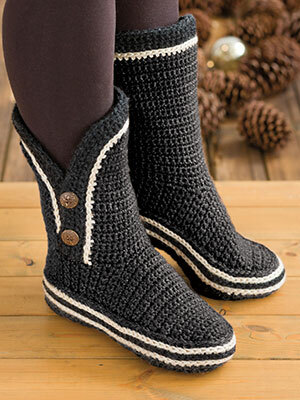 If you prefer to knit, here are a couple of slipper patterns for you too! You'll love walking around the house in these comfy, cozy slipper socks. Knit a pair for yourself and for each of your kids -- in everyone's favorite colors, of course -- and embellish with fun buttons that fit their personalities! Lounge around in comfort and style with these unique boots.